When I first heard the news that Sharpie was going to be making a liquid pencil I was interested immediately. 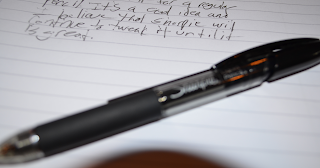 I press very firmly when I write, so when using traditional pencils or mechanical pencils I would break the tip quite often. It's a cool idea and something that sounds like it's out of the future. It sounds like something a robot would use to take a math test. Sadly the Sharpie Liquid Pencil does not live up to its futuristic sounding coolness. It has the potential to be a great product, but just isn't there yet. The body of the Sharpie Liquid pencil is nothing extraordinary. It has a simple design that looks good but not great. The top 1/4 of the pencil is actually used to deploy the tip of the pen/pencil/cool metal thing refill that writes with the liquid pencil ink. This makes the design a bit more unified but causes a bigger problem. When deployed the top 1/4 of the pencil rattles constantly while being used. This might not bother some people, but it drives me crazy. Other than this there are no real problems with the body of the Liquid Pencil. The design is simple but uninteresting. The other major problem with the Sharpie Liquid Pencil is the way it writes. To be blunt, it writes badly. 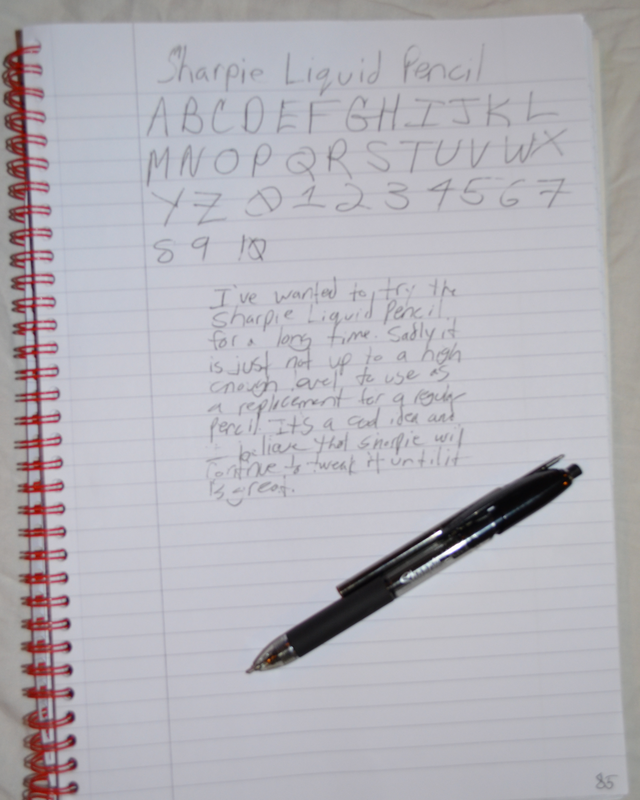 It skips, leaves a ton of white space, and requires a ton of pressure to produce a mark on the paper. It leaves a lot to be desired. Once again it is a cool idea, and I like thinking about robots taking tests with this. But until Sharpie makes some tweaks to this product, which I think they will do, I won't be using it very often. Cool can only get you so far.